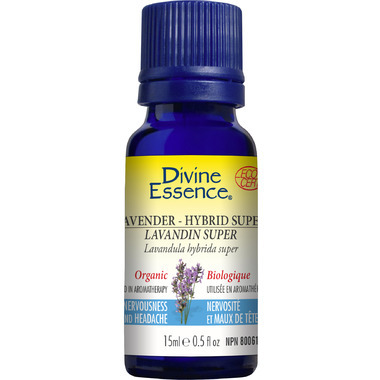 Divine Essence Super Lavender Hybrid Organic Essential Oil is a floral, expansive and calming fragrance. Smells divine. I wear it. I put it in my laundry rinse water and on my pillows. Will buy again. I bought this, along with another sleep time oil, to put in my son's bed time diffuser at night. I have ended up using it myself with just a drop on my pillow. It is a strong smell, but has helped me sleep more quickly and soundly. This is no small feat! Very nice smell, smells real. Use it daily in a balm. Love this lavender oil. This one smells like fresh lavender from the garden after crushing the leaves and flowers between the fingers. It's stronger than my lavender bulgaris and a touch more floral.